How much does Viraltag cost ? The pricing for Viraltag starts at $24.0 per month. 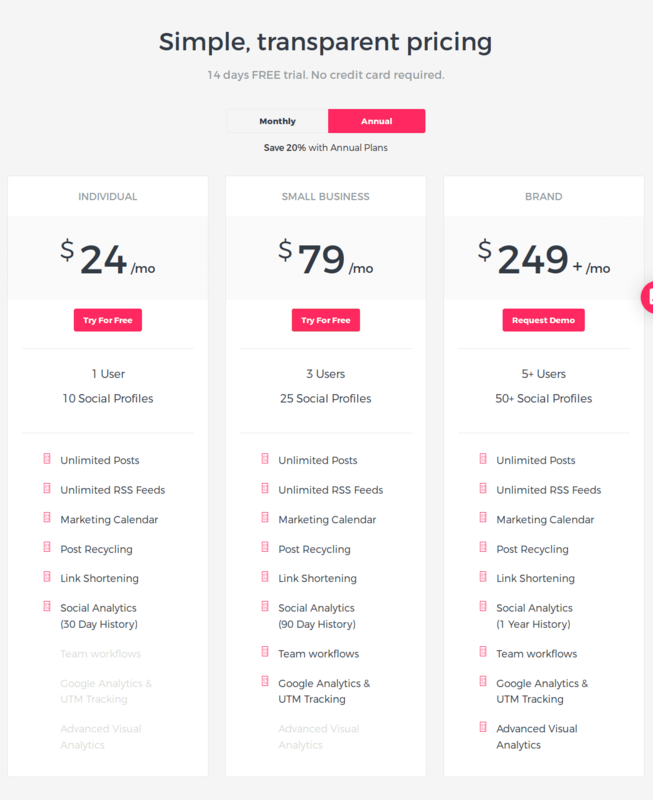 Viraltag has 3 different plans such as - INDIVIDUAL Plan at $24.0 per month, SMALL BUSINESS Plan at $79.0 per month and BRAND Plan at $249.0 per month. $24 Per Month Billed Annually and $29 Per Month Billed Monthly. Pros: -Viraltag allows sharing the same content on multiple platforms at the same time. You can use one account to control all of your posts on various social media like Facebook, Twitter, Linkedin. -The marketing calendar is really helpful to schedule posts. You can also recycle posts. 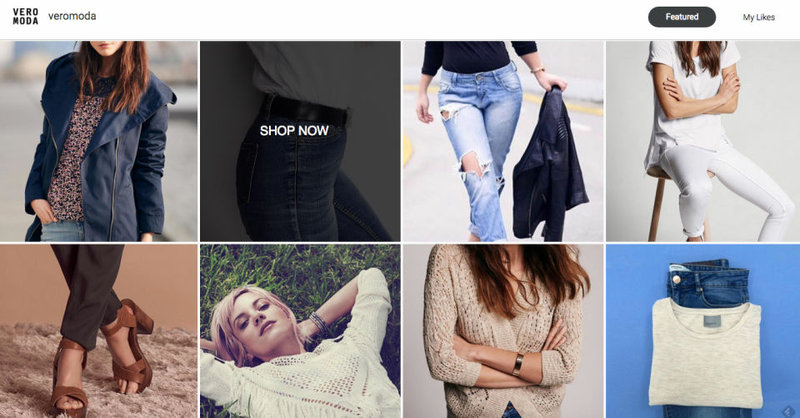 - I like a lot of features in Viraltag. The feature of suggesting hashtags is quite amusing. The option of previewing before publishing is very helpful. It is trying to improve with each version. Cons: The only thing I find annoying in Viraltag is that it starts getting slow with more use. The loading of content takes more time than usual. 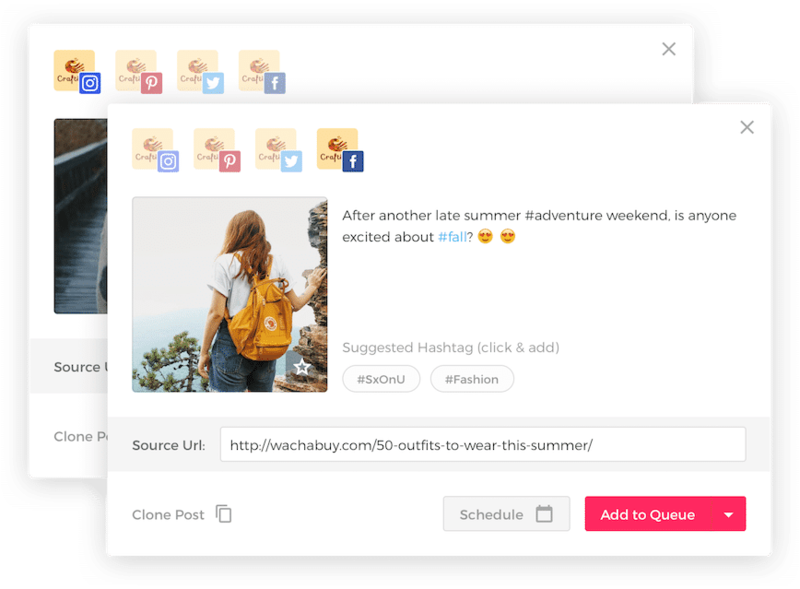 Overall: Overall, this is quite a useful tool for automating content sharing. It has made managing multiple networks easier. ViralTag fell flat in the analytics department. I tried a bunch of social marketing solutions while searching for one that fit me and my companies. ViralTag's fre trial was one that I gave a chance when I was searching. First, I love that you can add multiple social channels for your brand. Instead of being limited to one profile per network, you're limited to 10 profiles overall, so if your business is mostly on Facebook and Twitter, you can link those pages instead of needing multiple accounts. I loved the marketing calendar to help me keep track of which posts are scheduled where, since I try to adjust them for each network. Post recycling is great too... as an author, when a book is coming out, we have to post the same posts multiple times in the months/weeks leading up to a book release. Unfortunately, ViralTag fell flat in the analytics department. While the higher priced plan does offer Google analytics, this is simply not enough for a business to see actual engagement with our posts. Visual analytics with graphs, which are standard on many other solutions, are only available in the top priced plan at VT. I also wish there was a way to add more than one brand, as many of VT's competitors have. Overall, if you're a small business and only need limited social media engagement, ViralTag will work, but there are better, more robust systems out there for less cost. Pros: My favorite things about ViralTag include; evergreen content and Tumblr sharing. Cons: The constant need to reconnect social accounts which often leads to failed posts. Overall: Overall, during my time as a customer of ViralTag I was provided with excellent customer service and fast answers to my concerns. I just outgrew the platform and how it could be used in my business. I really the way it monitors the performance of each post on social media platforms. It gives you a detailed report and suggestion as to where you are going wrong. I really expect the analytical part to be and support for 360-degree contents. Today, when the campaigns run in 360-degree content we should have such feature available. Viraltag helps to easily automate my social media posting all in one place! Pros: Modern, clean and neat interface to work with. It has great support and sometimes, one can interact with live chat in real time. This is especially true if I ran into problems with the software not working properly in the browsers. It has got a responsive support rep, and so far the experience has been great and prompt. VT supports directly within Chrome browser, which makes social media posting even easier and faster! I found VT offers great value for money. Especially, it allows you to just manage 1 account for all media social media platforms namely Pinterest, Instagram, Facebook, Facebook Pages, Twitter and LinkedIn. Tailwind (another great social media posting tool), on the other hand, only allows 1 account for 1 social media platform. This implies that you have to pay more! However, VT has been responsive to users' requests, and it is constantly improving its features over time. 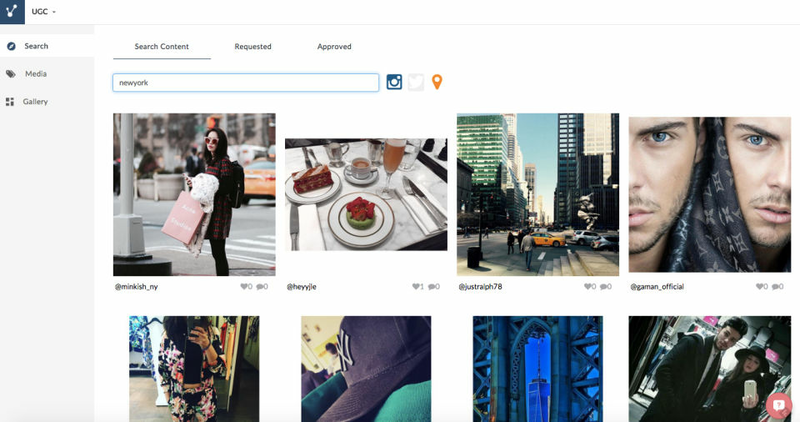 Recently, it has introduced new features like hashtag suggestions based on real time hashtag engagement, right within Viraltag's Dashboard. In addition, having this new ability to preview what your posts look like before they get published on social media! I am excited! Cons: It does not have certain functions like Tailwind such as shuffling one's social media posts graphically and using drag and drop adjustments. It lacked more sophisticated features such as more detailed reports and breakdowns of charts for each social media accounts. Overall: Saves time in automating my social media marketing all in 1 place! I have an issue with my subscription, and Viraltag does not answer my mails. This is bad customer service. What a pitty, other similar service providers are excellent in that field. I am cancelling my subscription because other tools allow you to publish on Instagram without manual intervention. 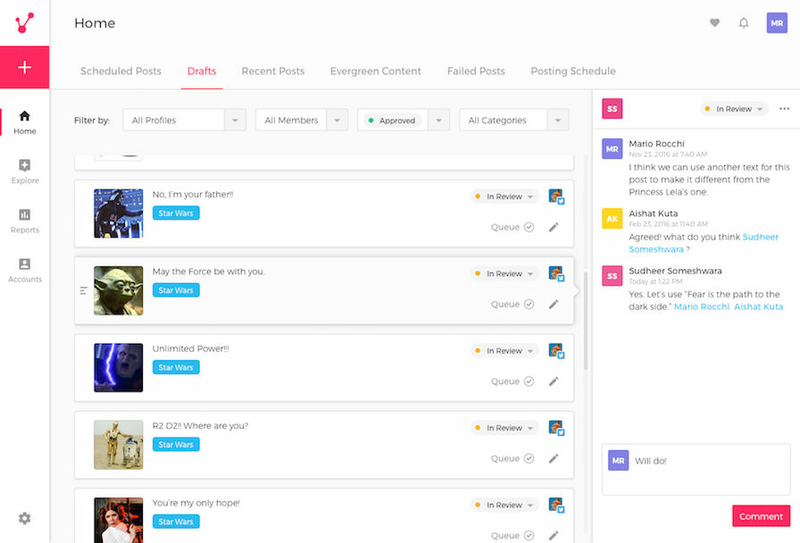 A great tool to manage social networks. Pros: It is my preferred tool to manage my publications in pinterest and schedule them. Viraltag allows you to manage all social networks professionally, with reports and also has a good price. I've been using it for about 6 months and since then I've managed to increase my engagement in networks and get more visibility for my publications. It works very well for teamwork and works very well to recycle evergreen content. I recommend it totally. Cons: The only counter I find is that for users who do not need it at a professional level is a payment tool, but if they want to try to see if they like it, they have the option to try it for free 14 days before buying it. 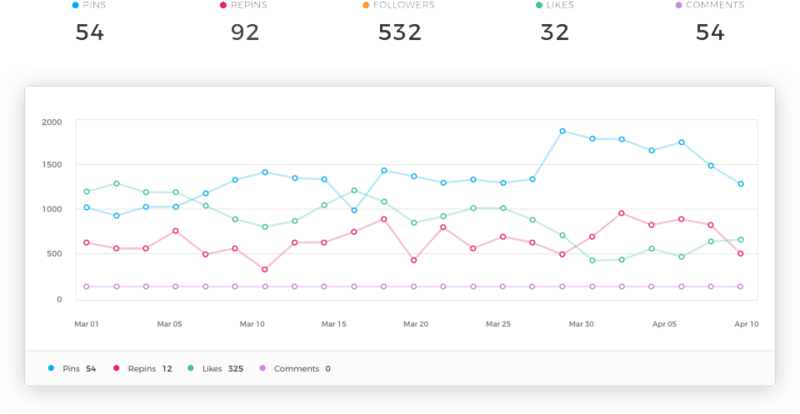 Overall: Improve the reach of the publications in social networks, increase my engagement in Pinterest programming the pins in the best hours and recycle evergreen content in an automated way. Pros: Their customer support! I've asked multiple questions before and always get an answer super quickly. Cons: I hate that they removed the evergreen feature for Twitter -- but they had to due to Twitter's policy change. Pros: The layout and the supported apps are very user friendly. 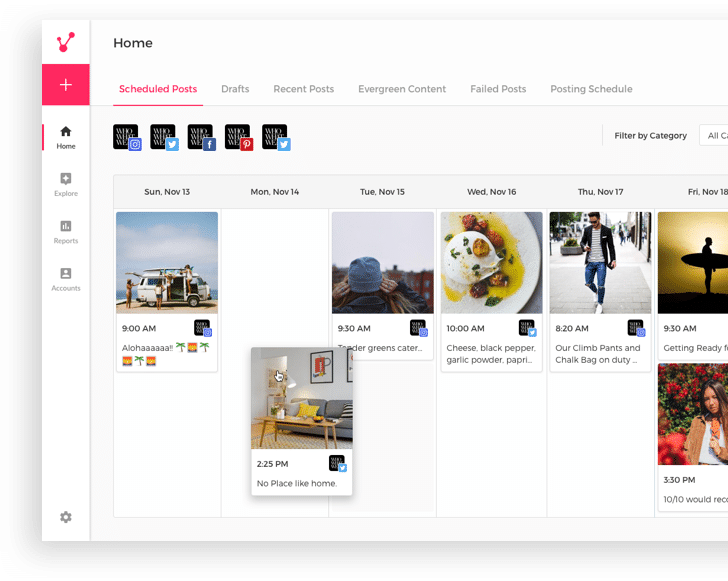 I found it also as the only social media organizer that supports supports the 5 major social media platforms for designers - Instagram, Facebook, Tumblr, Twitter and Pinterest. Cons: I have been facing and reporting errors with using the Viraltag app for Instagram on my iPad for months and it still is not working. I just downloaded the newest software update for the iPad, re-installed the Viraltag app and still it is not copying the text. Also another problem occurred with posting on my facebook page: the posts are done without the image!